The South Korean Transportation System, especially the ones within Incheon and Seoul, are extremely user-friendly and easy to navigate around. I recall my days when I came to South Korea as a tourist instead of a student. I knew nothing in Korean, except how to say "thank you", and "can you give me a discount?". In spite of that, I was able to get around so easily because there were English translated signs right underneath the Korean ones. Indeed, the Seoul Metropolitan Subway is one of the best in the world, with it being so convenient and accessible to all, foreigners and locals alike. 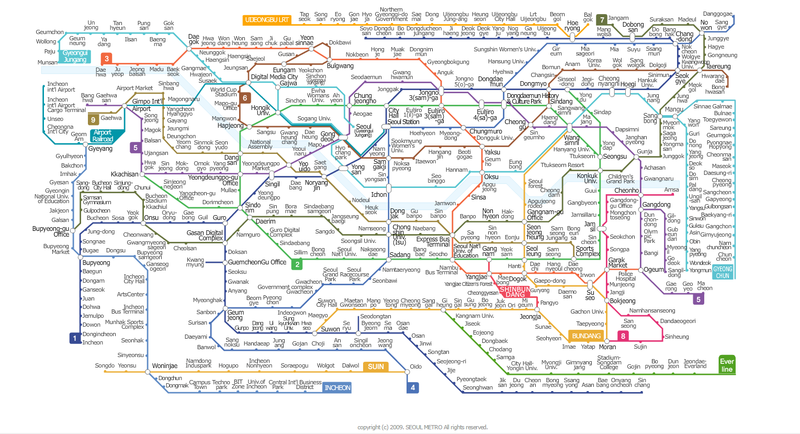 The best part about Seoul is that people have even created apps for the subway, so you are able to check where you want to go, on-the-go! You can select the station you're taking from, to the station you're going to, and every single thing is calculated for you, from the amount of time taken to arrive there, the amount of money it will cost, and even to the point where you can see the timetables of the trains. It even calculates the walking time transferring lines. Talk about convenience and service excellence. Other than their trains, they also have high speed rails that take you between different cities within South Korea, and the bus service in every city. With apps that are easy-to-get, you are able to search with ease getting from one place to another, with what buses you need to take, to where you have to get off, the cost and the time it will take. South Korea's technology has immensely developed to date, and it will continue to see growth as long as its people keep on taking the opportunity to expand and invest in the future of its people. It is getting more and more convenient for foreigners and locals alike to travel between places, without the hassle of asking someone, or hesitating. One of such high speed rails is the Incheon Airport Line that connects the Incheon International Airport to the heart and soul of Metropolitan Seoul in the shortest time possible. In preparation for the 2018 Pyeongchang Olympic Winter Games, South Korea has begun building a direct high-speed rail that will connect Incheon to Pyeongchang in an effort to aid the ease and convenience of transport from the airport to the Olympic Winter Games location itself with a time of 68 minutes, all without the hassle of transit. For a foreigner, making your way to go from buses to trains to buses again is extremely tiring, especially with luggage and baggage on hand. By the time you arrive at your destination, more often than not, you will already be exhausted. Visitors will be able to travel aboard the KTX from Incheon International Airport right into Pyeongchang and this would aid participants and visitors alike in 2018. One of the most important things about a country should be its transportation system. A country will be able to receive a lot of tourist activity and an increased boost in tourism if it can properly operate its transportation system in such a way where it is extremely convenient and accessible to foreigners, no matter the language spoken. Seoul has already achieved a part of this, and South Korea will continue to do this as technology advances and spreads to the other parts. The next step being connecting Incheon Airport to Pyeongchang, opening its doors to more opportunities such as the 2018 Pyeongchang Winter Olympic Games.